The space age began on October 4 1957 when the USSR launched the first unmanned satellite, Sputnik 1. This stunning triumph quickly lead to a "space race" between the two nuclear superpowers, the Soviet Union and United States. Both nations initially used converted intercontinental ballistic missiles (ICBMs) to launch their early unmanned and -- starting in 1961 -- manned spacecraft. Expendable launch vehicles directly or indirectly derived from ICBMs immediately became the preferred option, although the U.S. Air Force and NASA also investigated suborbital hypersonic jet- or rocket-powered aircraft such as the X-15 & XB-70. Missiles could be developed more quickly and easily than aircraft capable of flying 25 times faster than the speed of sound. The U.S. Air Force did briefly consider a small reconnaisance spaceplane that would have been launched into orbit by a Titan II missile -- the X-20 DynaSoar -- but the project was eventually cancelled since ballistic unmanned or manned space capsules were regarded as more cost-effective. Although engineers have been dreaming about fully reusable "spaceplanes" capable of carrying men and cargo into space as cheaply, conveniently and safely as ordinary subsonic aircraft since the late 19th century, the first realistic proposals only emerged after the first suborbital rocketplanes and ICBMs had demonstrated the required technologies. The Department of Defense was very interested in a scramjet-powered single-stage-to-orbit "Aerospace plane" but the preliminary studies in 1959-63 quickly showed that the necessary technologies did not yet exist. NASA, on the other hand, was primarily focused on two fundamentally different types of vehicles. The "Aerospace Transporter" was to be a horizontal takeoff-and-landing two-stage rocketplane primarily intended for transporting astronauts and other "high priority" small payloads to space stations. NASA also envisioned the Aerospace Transporter as an intercontinental passenger carrying vehicle for the 1980s. Several companies investigated the concept for NASA, including Lockheed (" Reusable Orbital Carrier ", " System III ") and North American Aviation (" Orbital Carrier Vehicle "). NASA only accepted horizontal takeoff designs since the agency felt they would have better launch abort characteristics and the lifting-ascent trajectory would produce lower g-loads on the passengers. Martin Marietta (" Astrorocket ") and Douglas (" Astro ") nevertheless proposed vertical takeoff, horizontal landing two-stage rocketplanes for both military and civilian missions since they regarded VTHL as simpler and more flexible. The "Nova" class of launch vehicle was intended for launching very large unmanned payloads, e.g. large space station or interplanetary spacecraft subassemblies. Whereas the Space Transporter's main aim was to reduce the cost per flight, Nova would reduce the cost per kilogram for bulk payloads in the 450,000kg range. NASA issued a number of concept definition contracts to General Dynamics, Martin Marietta and Douglas in 1963 ( Nexus, Renova, ROOST ) while North American investigated a similar airbreathing concept for the US Air Force. These concepts were relatively simple vertical launch & landing, single-stage-to-orbit (VTVL SSTO) rockets that would have been recovered using parachutes and retrorockets. The Aerospace Transporter and Nova were merely regarded as preliminary feasibility studies. While they did indicate that vast launch cost reductions were possible (e.g. $1100/kg for Lockheed's ROC, $600-$3500/kg for System III, $485/kg for Douglas' Astro), the development cost and risk would be high. NASA's interest in heavy-lift VTVL SSTOs waned after 1964 but Phil Bono of Douglas Aircraft Co. nonetheless made the concept famous with his innovative plug-nozzle VTVL SSTO proposals. Bono felt single-stage-to-orbit vehicles would cost less than TSTOs since only a single vehicle would be required, greatly reducing the development and operations cost and complexity. The main SSTO drawback was such vehicles would have to be very large and heavy, but Bono claimed the problem could be avoided by using expendable drop tanks to reduce the size of the reentry vehicle. " ROMBUS " would have replaced the Saturn V and been used primarily as a cargo vehicle for large moonbases (" Project Selena ") and manned missions to Mars by 1986 (" Project Deimos "). Like other planners during the early 1960s, Bono also regarded reusable rocket vehicles as ideal for intercontinental transport of passengers and cargo (" Hyperion ", " Pegasus " & " Ithacus ). But the aerospace establishment generally ignored his ideas as too far-fetched or risky, although Douglas proposed a small experimental " Saturn Application Single Stage to Orbit " vehicle (SASSTO) to demonstrate the key technologies. Although NASA's Committee on Hypersonic Lifting Vehicles formally endorsed the development of a fully reusable two-stage launch vehicle in June 1964, the military and NASA remained relatively uninterested. Apollo and other projects received most of the attention and resources from space planners. However, NASA and the Department of Defense did a gree to set up joint Aeronautics & Astronautics Coordinating Board (AACB) Subpanel on Reusable Launch Vehicle Technology in August 1965. The AACB subpanel then examined various NASA and USAF candidate concepts over the next twelve months. Three different kinds of concepts were analyzed. The AACB Class I & II were partially and fully reusable rocket-powered vehicles, respectively. The panel felt that Class I made more sense since it could become operational as early as 1974 for use with the Apollo Applications/Skylab Program program, and the comparatively low development cost could be amortized in only a few flights. The fully Class II vehicles would have cost far less per flight but would also have required high flight rates to compensate for the higher development cost vs. Class I. 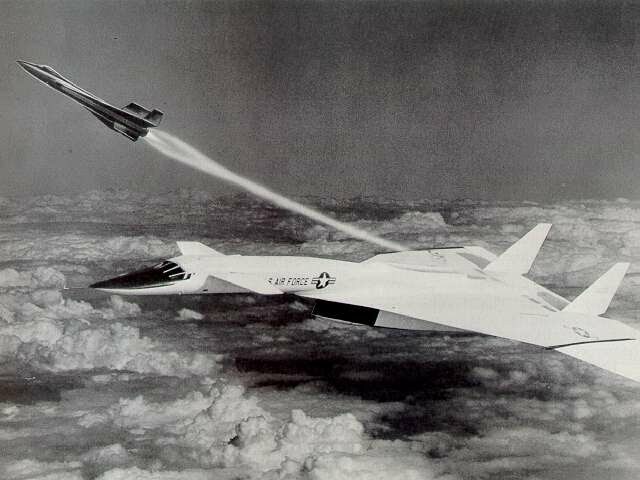 The final " Class III " (airbreathing two-stage HTHL spaceplanes) was dismissed as impractical, and sled-launched pure-rocket HTHL TSTO systems also virtually disappeared from the scene after 1966 despite NASA's early interest in the concept. The AACB report turned out to be quite influential since it predicted many of the trade-offs that would face designers of the Space Shuttle five years later. NASA and U.S. Air Force contractors mostly concentrated their efforts on simple "Class I" reusable spacecraft and expendable launchers in 1967-68 as NASA was trying to get its Apollo Applications Program approved. AAP would have consisted of relatively small "Skylab" space stations and the space transportation budgets and requirements were quite modest. The most advanced design was the partially reusable drop-tank single-stage-to-orbit concept first advocated by Lockheed in 1965 (" Starclipper ") and later refined until 1971. McDonnell-Douglas proposed a similar " Integral Launch & Reentry Vehicle ". Like Phil Bono's earlier designs, the main goal was to reduce the development cost. Fully reusable TSTOs were expensive since two separate vehicles (a booster and an orbiter) had to be developed and operated. The General Dynamics " Triamese " represented yet another solution to the high development cost problem; use three virtually identical reusable booster/orbiter element vehicles rather than develop two different booster and orbiter spaceplanes. The Starclipper, ILRV and Triamese eventually evolved into the "space shuttle" which, along with space stations/bases and nuclear & chemical interorbital space tugs, was to be one element of NASA's new ambitious interplanetary "Space Transportation System". By mid-1969 the agency decided that only fully reusable vertical-takeoff, horizontal-landing two-stage concepts would make sense for the extremely high flight rates envisioned. The shuttle would fly up to 66 missions a year in 1975-85 and 87% of the flights were dedicated to space station crew/propellant transfer or resupply. NASA awarded four Phase-A study contracts worth $0.3 million in February to North American Rockwell , McDonnell-Douglas , Lockheed and General Dynamics . Martin Marietta also participated using company funds. The expected development cost of these concepts was in the $5.5-6.5 billion range [1969 dollars] and the cost of launching a 22,680-kilogram payload about $250-$1200/kg depending on the flight rate. NASA awarded two Phase-B shuttle definition contracts worth $8 million each to consortiums led by North American Rockwell and McDonnell-Douglas in May 1970. Bids by Lockheed/Boeing and Grumman were rejected, although these companies received Phase A contract extensions to continue their investigations of "Alternate Space Shuttle Concepts". NASA also awarded a $750,000 ASSC contract to Chrysler for studying its " Single-stage Earth-orbital Reusable Vehicle " (SERV). The Phase-B shuttle grew increasingly larger (gross liftoff weight of 2300t, up from Phase-A's 1600t) and more expensive (from $5.5-6.5B in 1969 to $9-11 billion by mid-1971). This was mostly because Congress and Nixon Administration refused to provide funding for the space station and other new manned spaceflight initiatives. NASA now tried to "sell" the space shuttle to sceptical users in the scientific community and the military as the ideal low-cost transportation system for launching unmanned existing payloads. USAF support now became absolutely essential for the political survival of the project, and NASA agreed to design the shuttle so that it would meet all military requirements (large payload bay, delta wings and expensive thermal protection systems for additional maneuvrability during reentry etc.). All this increased the cost of the system, but NASA needed all the payloads it could get since its analyses clearly showed the shuttle would be cost effective only if it replaced all existing expendable launch vehicles. By the time North American Rockwell presented its final Phase-B proposal in June 1971, it was already clear NASA would have to develop a less expensive partially reusable shuttle costing only half as much money. The Grumman/Boeing "H-33" design managed to greatly reduce the size, cost and complexity by moving the orbiter's hydrogen fuel into expendable drop tanks. Lockheed proposed another drop-tank SSTO shuttle that eventually would be upgraded into a fully reusable TSTO by later adding a booster. NASA and its contractors repeatedly redesigned the shuttle in June-December 1971 to cut the development cost in half. The orbiter propellants were moved to a expendable drop tanks just like Lockheed and others had proposed in the 1960s, and the winged flyback booster was replaced by a simplified unmanned version that would be recovered and reused after falling back into the sea. All this reduced the development cost from $10 billion to only $5.5B in January 1972, when President Nixon finally approved the project. The marginal cost per flight had increased to $10.5 million [1972 rates -- $1500/kg in 1999 dollars) from Phase B's $4.5 million/flight But a highly influential economic analysis by Mathematica Inc. still claimed the final "Thrust Augmented Orbiter System" (TAOS) Shuttle would be cost effective vs. existing expendable rockets, mostly since it would be possible to design cheaper payloads. According to Mathematica, satellites could now be built like cheap "alarm clocks" rather than "Swiss watches" since the shuttle would provide cheap and frequent access to space, and its astronauts could repair satellites in orbit or even return them to Earth for refurbishment. Although the Space Shuttle program was approved in 1972, many engineers and space enthusiasts regarded it as merely the first step towards truly low-cost space transportation systems rather than as an end in itself. Robert Salkeld of the System Development Corporation was a strong proponent of next-generation fully reusable shuttles and published several comparative analyses throughout the 1970s, most notably in Astronautics & Aeronautics and other AIAA publications. Although Salkeld initially proposed relatively small spaceplanes launched from subsonic aircraft such as the C-5A Galaxy, he soon started to regard VTHL single-stage rocketplanes as the most cost-effective option. Most designers had previously dismissed this class of vehicle since the weight of the propulsion system and wings appeared to rule out SSTO. Salkeld argued that "tripropellant" rocket propulsion would be more efficient and reduce the total gross liftoff weight by 25%, finally making VTHL SSTO feasible. Hydrocarbon fuels such as kerosene or JP-5 have a higher density than liquid hydrogen fuel. This reduces the size and weight of the propellant tanks, but hydrogen produces a much higher exhaust velocity which means less fuel is required. Salkeld suggested it would make sense to use both hydrocarbon and hydrogen fuel. The high bulk density of hydrocarbon fuel is quite important during launch, when high thrust matters more than exhaust velocity. Later on, the vehicle -- now considerably lighter -- switches to highly efficient oxygen/hydrogen as it leaves the atmosphere. Salkeld found that it made more sense to develop an engine capable of buring all three propellants rather than carrying separate engines, and he & Aerojet engineer Rudi Beichel explored this "dual fuel, dual-expander" rocket engine in a series of papers. They also investigated its impact on different SSTO concepts (VTHL, VTVL, HTHL). The VTHL design probably would not be feasible withouth tripropellant propulsion and/or advanced materials. In contrast, the sled-launched HTHL SSTO rocketplane would not benefit as much from the concept. Salkeld also investigated the possible merits and drawbacks of different SSTO launch and landing modes, without picking a favored concept. He did regard VTVL SSTO as better suited for heavy-lift missions (e.g. as a fully reusable Space Shuttle booster) while HTHL SSTO seemed more promising for launching small payloads or suborbital missions such as fast-package delivery. In general, vertically launched SSTOs seemed to have better growth potential than HTHLs, but they would require new engines (plug nozzle aerospike and/or tripropellant propulsion) whereas HTHL SSTOs in principle could use SSMEs. HTHL would however require new advanced structures and a ground accelerator rather than Shuttle-level technology (VTHL) or ballistic technologies (VTVL) and launch facilities. In either case, Salkeld felt the development cost and risk would be less than for advanced airbreathing propulsion. The mid/late 1970s future space transportation studies were dominated by solar power satellite (SPS) launch requirements. Proposed by Peter Glaser in the late 1960s, the SPS program called for the construction of giant solar collector satellites in space that would beam down energy in the form of microwave radiation to receivers on the ground. The initial studies indicated SPS could provide cheaper electrical power than other options. But the satellites would have to be enormous, spanning several kilometers and weighing tens of thousands of tons. They would be assembled in space from components launched by low-cost heavy-lift rockets. Consequently, much of NASA's future space transportation planning during the mid/late 1970s was confined to extremely large low-cost launch vehicles. But the agency also felt there would be a need for a smaller, Space Shuttle-class vehicle for launching 29,500-kilogram "priority payloads" such as space station crew transfer and resupply. Martin Marietta investigated a fully resuable vertical takeoff, horizontal takeoff SSTO rocketplane for NASA's Langley Research Center while Boeing proposed a sled-launched HTHL SSTO (in-flight propellant transfer was also studied but rejected in the end since it would have required a very large subsonic tanker aircraft capable of transferrring 76t/minute of propellant). These vehicles were intended as successors to the Space Shuttle in 1995-. Overall, the contractors concluded that SSTO appeared to be clearly feasible in the 1990s due to significant improvements occurring in applicable technologies. The HTHL design would have required a relatively large wing and efficient tankage but the propulsion mass and re-entry wing loading would also be less than for the VTHL. The HTHL SSTO launch mode (sled assist, in-flight propellant transfer or rolling takeoff gear) also reduces the T/W requirement and vehicle mass, but VTHL nevertheless appears to be most attractive as long as limitation to 1-2 launch sites is not detrimental. The SPS heavy-lift launch vehicles were quite similar to the 1963-64 "Nova" class of RLVs. NASA's Johnson Space Center carried out a number of feasibility studies supported by Boeing, Rockwell International and Martin Marietta in 1975-80. JSC initially favored an enormous two-stage VTVL rocket capable of launching 700t payloads, but there were concerns about landing safety so the 1977 baseline was a smaller VTHL TSTO with 50% reduced payload capability (fig.). Boeing investigated a 272-tonne "Leo" VTVL SSTO and different versions of a 2-stage VTVL TSTO in 1976-77. The company concluded that for extremely large payloads, the operational simplicity of SSTO was less important than the lower propellant cost and higher payload capability brought by TSTO. Boeing's later SPS investigations focused on winged VTHL 2-stage rockets . Most of the aforementioned concepts (and Martin Marietta's VTHL TSTO concept from 1977 ) utilized the tripropellant propulsion concept in order to reduce the size of the vehicle. In 1978, Rockwell International proposed a giant rocket/ramjet powered HTHL SSTO spaceplane (" Star-raker ") that only would have had a 100-tonne payload capability. This vehicle would hovewer have been compatible with existing airports and Rockwell's research indicated the design would be more likely to accomodate the extremely high flight rates required by an SPS construction program. Rockwell also investigated a number of VTHL TSTO rocketplanes. Boeing's and Rockwell's cost tradeoff analyses from 1980 indicated smaller and cheaper vehicles (120t payload capability, down from 272-400t) would reduce the total cost of a solar power satellite although the transportation cost per kilogram would be slightly higher.